Imagine a warehouse stacked 12 feet high with bundles of vintage clothing that were hand-picked in the late 1970s and never opened. What sounds like a vintage aficionado’s fantasy is actually a reality. How is this possible, you ask? The bundles were stored away as future inventory for a thriving little vintage clothing business called Tribe Trading. In the 1990s Toronto was one of Hollywood’s primary locations for shooting because the great currency exchange from US to Canadian dollar meant millions could be saved by setting up shop in the Great White North. Tribe Trading had been a dealer of vintage clothing since the early 70s and quickly became Toronto’s leading source for films that required authentic period wardrobe. Enter the new millennium and the events of early 00’s. Animosities between US and Canada began to surface regarding September 11th and the war that followed. The value of the US dollar began to decline and then Arnold Schwarzenegger campaigned to terminate filming abroad to help the local economy. As a result Toronto’s film business became a ghost town and those bundles of vintage clothing have been sitting there ever since. Now for the good news. We’ve been granted exclusive access to these bundles by teaming up with Tribe Trading and creating an ongoing series of auctions called, “Raiders of the Lost Bundles.” The first 10 are up now but they are merely the tip of the iceberg, we plan on listing at least 20 per week for a long time to come. This is without a doubt the coolest thing we’ll ever do in the field of vintage clothing so we created a trailer to give you a glimpse of the goings-on. We’re in the process of creating another video which is a private tour through the premises with Olivier Normand, the owner of Tribe and mentor of me. The video will be complimented by an interview discussing his legendary career in vintage clothing. Stay tuned. 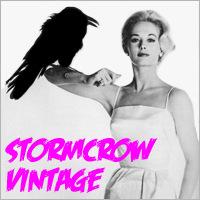 Visit our homepage for more information on vintage clothing.